Organized fraud rings are attacking contact centers more than ever before, according to a new report from Aite Group. These fraud rings call repeatedly, using data acquired from data breaches and social Websites to impersonate customers. 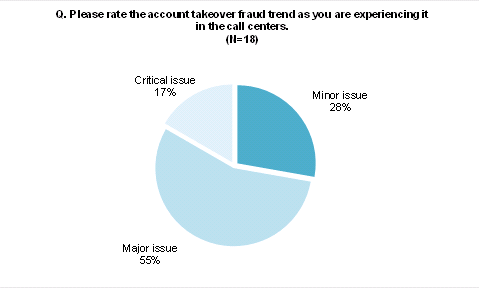 The result is that account takeover fraud through the contact center is increasing, with 55 percent of survey respondents describing it as a major issue and another 17 percent calling it a critical issue. Based on interviews with 25 executives at 18 of the 40 largest FIs in the U.S. by asset size, Aite Group found that only one executive noted that fraud losses are trending downward due to a complete overhaul of authentication and fraud prevention processes in contact centers as well as policy changes and agent training. Executives at 17 percent of FIs feel losses are flat but admit they don’t have good insight into contact center fraud trends due to lack of staffing to perform root cause loss analysis, the report notes. More than three-fourths of respondents said fraud losses are trending upward to varying degrees; 17 percent said losses have increased 25 percent or more compared with the prior 12-month period. Aite also discusses possible solutions to stem fraud in the contact center, including voice biometrics (passive and active); fingerprinting devices to spot fraudsters; using the mobile device to authenticate customers; call and device solutions, such as behavioral biometrics, and more.